I wanted to use the leftover prosicutto and asparagus rolls from the party, so I figured on cutting those into chunks and putting it in a risotto. Then I figured I could also add the leftover mushroom and tarragon filling from the mushroom cups. I had maybe a cup of it left and it would add some creaminess and earthiness. I also had about 6 slices of prosciutto and 12 asparagus spear left that I did not use for the rolls, so in they went, too. First up, a simple risotto that serves as the base for whatever ingredients YOU like to toss in there. Once the rice is al dente or cooked to your liking (it will be a bit sticky, that is just the way risotto is since it is so starchy), toss in whatever ingredients you like. I had the asparagus and prosciutto (I tossed the raw asparagus in a couple minutes before rice was done since it had to cook a little to catch up to the asparagus from the party). I have made this in the past with some frozen peas and prosciutto. It's also good with some frozen artichoke hearts, roasted red peppers, grilled shrimp, sliced mushrooms, a drizzle of truffle oil if you are feeling decadent ... Pretty much anything. I finished the dish by stirring in the Parmesan and parsley. And it went quite well with a bottle of wine that was opened, but not finished at the party: 2004 Francis Coppola Black Label Claret. Thanks again for that, Bob. This was from something I saw in Sunset magazine. It seems to be exactly what I saw in Sunset. 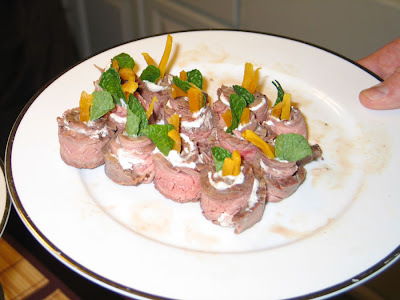 I made the flank steak and cheese mixture two days ahead, sliced the steak a day ahead and rolled them up the day of the party. I used two big flank steak from the Costco meat department. They came out great. I made these two weeks ahead and froze them, cooked. Combine all the ingredients. I find the best way is to use my hands. It feels a little gross, but then I know all the stuff will be really well-mixed. Form meatballs into 1-inch balls and place in large roasting pan. Roast 20-25 minutes, turning every 5-7 minutes so they can brown on all sides. Once cooled, these can be frozen. Thaw before reheating. To reheat them, I put them in a skillet with a splash of chicken broth and steamed them for about 5 minutes. Heat oil in sauce pan and add garlic and ginger. Sautee for just a couple minutes over medium heat, but do not let it brown. Add store-bought hoisin sauce and wine. That is it for the sauce. I made this three days ahead and stuck it in the fridge. Bring large pan of salted water to a boil. Add peas and cook until bright green and flexible. This should be 30-60 seconds. Warm hoisin sauce in microwave or on stove. Pour onto platter in thin, even layer. 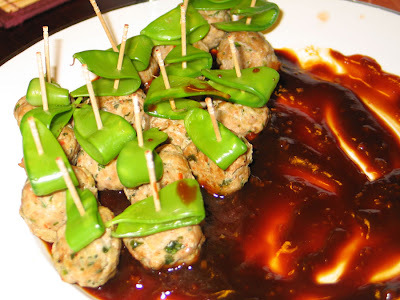 Fold each snow pea in half and attach it to a meatball with a wooden pick. Place the meatballs on top of the sauce. This one sounds more complicated than it is. Especially since I did in stages. But that really makes it easier. Then you just have to heat the meatballs and sauce and serve them. I think these meatballs would be good in some type of brothy soup with bok choy. I may have to experiment. Oh, and you need a mini-muffin pan to make these. 1 1-pound loaf sliced white bread. I like Milton's brand if you can find it. Cut bread into 2-inch squares. I have a set of square cookie/pastry cutters and use one of those. You can just use a knife, too. I get two squares per bread slice. Brush a light coating of butter on each side of bread. 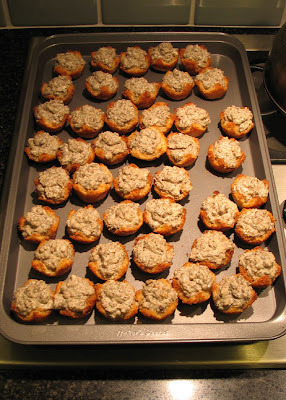 Press the bread square into a mini-muffin tin making the sides fairly even. Bake 5 to 8 minutes or until golden brown. They can be made ahead and kept in airtight containers or frozen for up to three weeks. Add mushrooms and onions, seasoning with salt and pepper. Cook about 7 to 10 minutes, or until mushrooms start to brown. Add wine and cook until liquid is absorbed, about 5 minutes. Put mushrooms mixture in food processor with creme fraiche/sour cream, Parmesan and tarragon. Pulse 4-5 times or until mixture is combined but not pureed. I made the filling a week ahead and froze it. I took it out the night before the party and thawed it in the fridge. It worked great. Spoon mixture into bread cups and place on baking sheet. Bake in 400-degree oven until filling is hot. The recipe called for serrano ham, which is Spanish cured ham. It is great, but tough to find. I used prosciutto di Parma, which is great and easy to find. And the book said this was a fine substitute. This is the recipe from the book. Obviously I made more than 12 of these. Coat bottom of a roasting pan with olive oil. Cut each piece of ham in half. 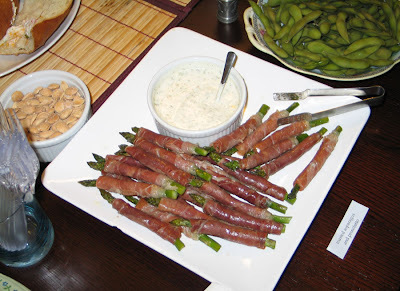 Roll asparagus spears in ham slices. Roast for about 10 minutes, depending on thickness of asparagus. They should be tender, but firm so they can be eaten as finger food. The recipe called for making a complicated aioli. I passed on this. I blended some mayo with dried tarragon, lemon juice and a bit of sugar. I got a sweet, but tangy sauce that went nicely with the salty ham. I served this in a little bowl on the side of the asparagus/ham rolls. Add onion and season with salt and pepper. Cook until tender, 5 to 7 minutes. Put spinach in a food processor, adding the onion, 1/2 cup of the bread crumbs and the remaining ingredients. 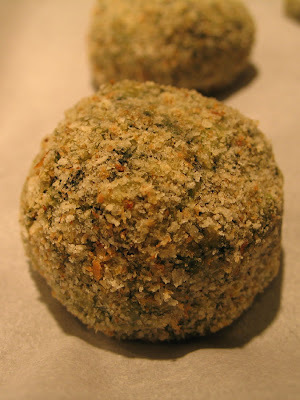 Form mixture into 1-inch spheres and roll each sphere in remaining bread crumbs to coat completely. Place on foil- or parchment-lined baking sheet. Bake until hot and lightly golden, about 10 minutes. Do not overcook, or they will get dry. I made these a few days ahead of time and frozen them on a baking sheet. Once they were individually frozen, I put them in a freezer bag. I took them out to thaw the morning of the party and cooked them just before guests arrived. The freezing worked great. I have made these before with no freezing and there was no difference in taste or texture.